I hope that all of you had a nice Christmas or whatever holiday or time you celebrated in the past few days. Even though I didn't blog, I have been knitting. 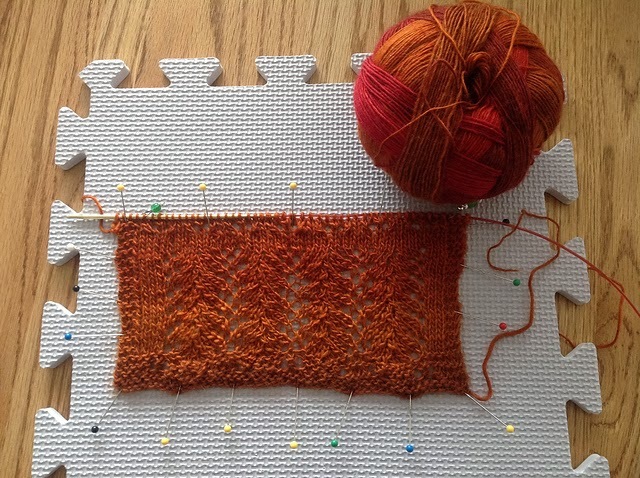 About a month ago I found a knitalong group on Ravelry in which the participants were going to make an Advent Scarf. It sounded intriguing so I signed up. The designer published a bit of the scarf pattern each day, starting on December 1st, the last one being December 24th. Each section would be different and separated by a Spacer section of 8 rows. The scarf, as written, was going to be 20 inches wide (103 stitches), too wide for my liking. 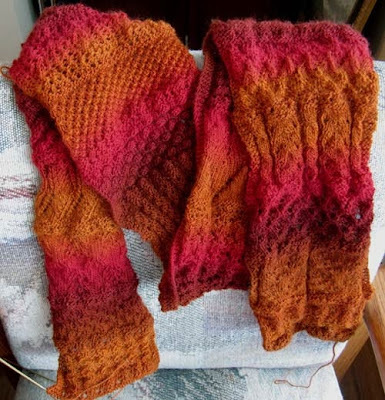 I was interested in a scarf width, not a shawl width, so I knit with the 49-stitch group and my finished scarf will be about 10 or 11 inches wide when it's blocked. As of today I'm almost finished. I've completed to the end of Day 23, plus the next Spacer section...one more Day and one more Spacer to go. I'm using Zauberball yarn, color #1874, in a brown/copper/red combination. It looks quite autumnal. The colors in the picture aren't exactly accurate. The scarf and yarn are more red, less pink, "in person"... and not nearly so neon/fire-y in appearance. While I like the colors, I think that, if I was to make another one (which I won't), I would use a single color instead of a yarn with long color changes. I like the yarn, but the changing colors detract from all the lace and cable stitches in my opinion. I've enjoyed the knitalong and would do a different scarf if the opportunity arose again next year. I'd want to have my Christmas knitting done in advance, however, as knitting the scarf is quite addictive.